Got to dress up 80's style for my best friends 30th birthday bash on Saturday. PS. 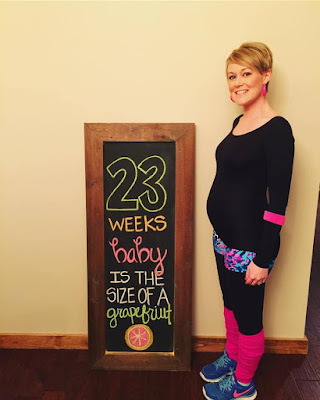 Leotards are not the best choice of clothing for pregnant people! Sleep? Sleeping really great! I swear it's the lavender essential oil I diffuse every night. Best moment this week? Finally seeing baby girl at our anatomy scan on Friday. 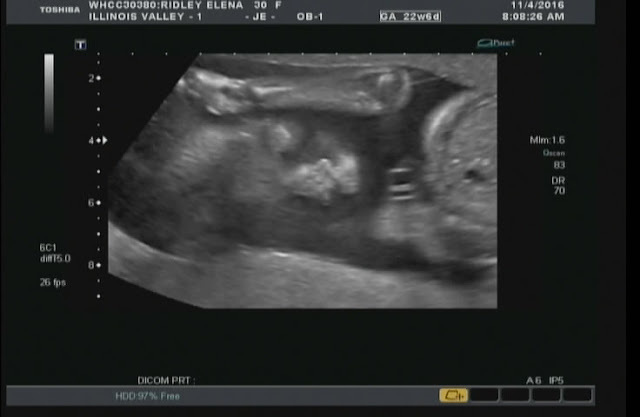 She is breech at this time which isn't really a big deal this early on. It was awesome to see & hear that all of her necessary parts were found & measuring correctly! Below you can see her face, eye, nose, and her arm & hand up against her face! Miss anything? Just the usual, alcohol! What else is there to miss?! Food cravings? Sweets as usual. Symptoms? Pregnancy brain is on in full effect, not sure if you noticed or if you follow me on Instagram you may have already saw, I spelled "grapefruit" wrong on my chalkboard. I've noticed that sometimes when I speak, write, or type, I get confused on my words lol! Looking forward to? The holidays! We get a 4 day week this week for Veteran's Day which is Friday, always so grateful to everyone who has served this country in order for our freedom. We only get this day off because of you! Also next weekend we are going to get together to start planning for my shower which is January 21st. You best believe I am involved in all of the planning & executing of this shower. I know my friends are totally capable, but I do have a vision that I'd really like to be a part of making come to fruition. Thanksgiving will be here soon and then Christmas soon after that. It's the most wonderful time of the year! Love the 80's attire!! Sorry but the pregnancy brain doesn't really seem to go away after the pregnancy either..haha Or at least I feel like I am still dealing with it, or maybe it's just called mommy brain now. Have fun planning your shower! You deserve it! You look so cute and so does Georgia! My daughter is so stubborn at ultrasounds and would not stop covering her face yesterday. I was 32 weeks and 2 days yesterday and this "little" girl is already weighing 6 lbs 1 oz!!! I'm going to have a huge baby. How cool that you are a part of planning your shower! I cannot wait to see all those little details!